Refugee? To register as a Refugee, click here. Your sympathy cannot help a refugee. But it is a beginning. 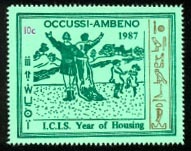 OAHCR is the Office of the Occussi-Ambeno High Commission for Refugees. Our job is to co-ordinate the galaxy-wide efforts to solve refugee problems. To give the rights of people back to refugees. The right to education, housing. Freedom of or from religion. Identity papers. Travel documents. Legal protection. You can show your solidarity with people in need by supporting the voluntary refugee organisations on your planet. They don't ask your help to support refugees forever and ever. And you can do more than you realise to change inequitable social systems, which through war, racism, and geriatrarchy, cause the refugee problems in the first place. Help refugees live a useful, peaceful and happy life somewhere in the galaxy. Just as you do.